Which are the best books for CAT Preparation? – This is one of things that I have seen a lot of CAT aspirants worry about. Probably it is natural to get worried about important things in life and CAT preparation is definitely one of the important steps in anyone’s career. Having said that, the choice of books for CAT is probably not an important one. There are plenty of great books for CAT that are available in the market that you can use and there is very little that separates them. First of all, if you are looking at understanding and application I would much rather recommend that you go ahead with an online coaching course for CAT. It would offer you a lot more than what any book for CAT can because it has videos for conceptual clarity and live classes for doubt clarification. Having said that, it is also necessary to have some material or the other so that you can practice and eventually improve yourself to solve CAT level questions easily. I would also recommend that you try out the study material from IMS / TIME / Career Launcher as your first resource. This material is very well designed and keeps the needs of students as the first priority. The slight problem that exists with TIME material, in my opinion, is that sometimes it tends to be a little bit harder than required. You can easily skip out on that particular part of the chapter or those set of problems. However, you should have the knack of knowing what is relevant from a CAT perspective. Once you go through enough number of previous year CAT questions – you will develop that knack. In case you get a doubt regarding the same, you can obviously ask around in some forum. A basic thumb rule could be – can this question be solved from the concepts that you learn in class 10th? If yes – then it is probably relevant for CAT, otherwise it is not. If it is a Logical Reasoning or Data Interpretation question that is really hard and you look at the solution and it gives you feeling empty headed – there is a very low chance of it getting asked in CAT. Even if it gets asked in CAT, there is a very low chance of most CAT aspirants, including you, solving it during the exam pressure. It is best to learn what to skip during your CAT preparation phase, so that you can do it in the main exam as well. Some of the books that I think can help you with CAT Preparation are given below. Let me add, you should use these provided you cannot arrange for IMS / TIME / Career Launcher material from somewhere. The set of all four books for CAT should cost you around 2500 Rs. I would not recommend that you go in for that. The only book that you should get from this set is the Quant book. These two books for CAT Prep as a combo would cost you around 1500 Rs. It would be money well spent. While for Quant, it can be debated which is the better book between TMH / Pearson, for LR / DI / RC – Pearson book wins hands down. I specially love the way RC is dealt with in the Pearson books for CAT. To be honest, I would have recommended that you go in for The Pearson Complete Guide to CAT that costs around 800 Rs. but the number of printing mistakes / errors is a bit too high in that one. Verbal Ability and Reading Comprehension by Ajay Singh – It is a pretty good book for CAT Reading Comprehension section. It has loads of passages for you to go through. I am often surprised by the lack of popularity of this one. It can be picked up if you are looking at a book specifically for VA and RC. Quantum CAT by Sarvesh Verma – If you already have some coaching institute’s material and are looking for something extra to practice in Quant (I do not agree with this idea but if you are), then probably this is the book for CAT quant that you need to pick up. It covers a large variety of questions and the difficulty level is also maintained. This book does not have the unnecessarily hard questions like most of the other books for CAT. Both of the above books are around 700 Rs. Which books for CAT Preparation should you buy? Now that I am done with the dispensing of ‘Gyaan’ regarding the books, if you are still confused about which book to buy – let me try and simplify it for you. If you have study material from a coaching institute like IMS / TIME / CL, you should try to finish it from start to end. You should not even look at any other books. If you have study material from a relatively smaller coaching institute like MBA Guru / Total Gadha / Byjus – I have no idea about how good or bad they are. Talk to your faculty – they will give you an unbiased opinion about it. If you want a book just for Quantitative Aptitude – go for Arun Sharma or Quantum CAT. Pick Arun Sharma if are comfortable searching on forums and looking up answers. That will help you learn some more stuff as well. Pick Quantum CAT if you just want to sit with the book and solve. If you want a book just for LR / DI / RC – there isn’t something that I can recommend. I don’t think you need a book just for that. Use previous year papers, and previous year mocks, etc. If you want books for everything – go for the two books by Pearson. As far as books are concerned, let me start with a few books that I do not think are very useful from a CAT preparation perspective. Word Power Made Easy by Norman Lewis – A brilliant book for building your Vocabulary. This book is probably the best possible way to develop a good vocabulary. The problem, however, with this book is that it is voluminous and bulky. Rarely have I come across a CAT aspirant who has been able to stick to this book for over a month. They start it with full gusto but give up on it in the middle. If building vocabulary is your focus, using some mobile apps is a good idea. The best possible “realistic” way to build a good vocabulary is to read books. 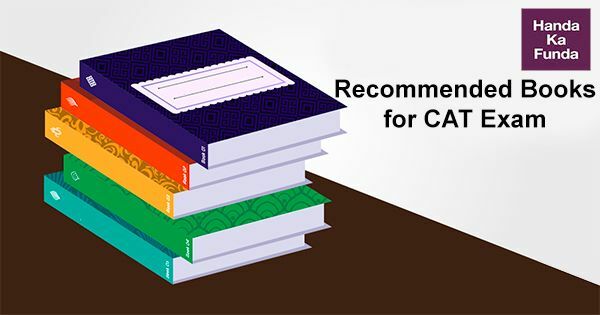 Here is a list of recommended books for CAT aspirants. How to Read Better and Faster by Norman Lewis – Once again, a really good book. It is more of a workbook and has a bunch of exercises that can help you improve your reading speed. But perhaps – that is not something that you need. If you have a good reading speed, it helps. But probably it should not be your priority. The length of CAT passages have ranged from 400 words to 1000 words in the past decade. You can also say that it is anywhere from 150-250 words per question. Questions in CAT have rarely been so simple that if you speed-read the passage, you will be able to answer them. You might not need a deep level understanding of the passage but a superficial glance is not going to help you either. You might improve a little bit if you go through the exercises mentioned in the book but I would still recommend that you improve your reading habits rather than improving your reading speed. NCERT Books – I have been guilty of recommending the same to a few students who struggle with the basics of a particular topic. Over time I have realised why this recommendation does not work. The reason is not that these books focus on the wrong concepts. The reason is that they are not required. If you as a student are unable to understand a particular concept, it is not because of the book you are using but it is because you are not able to understand what is given in the book. Probably you need someone to explain it to you. You need someone who can clarify your doubts. The book is not at fault here – you are! I am sorry if this sounds rude. You should stick to your CAT books and study material. High School English Grammar and Composition by Wren and Martin – It is a great book but as the name suggests, you should have read it in high school. The importance of Grammar, sadly, has reduced over the years in CAT. Even earlier, CAT did not mean to test if you knew the definition of a gerund or how it is different from an infinitive. The objective always was to check if you were able to identify the correct sentence or not. Having said that, if you have a good command over English grammar – it will help you in the later stages of Group Discussion and Personal Interview. Most good Business Schools have a ‘Written Ability Test’ to assess your communication skills. Bad grammar at that stage can be a real problem. Once again, reading books (not by Chetan Bhagat) is probably a good way to improve in that area. It would be great if you start blogging. If you write a blogpost a week, you would find remarkable improvement in your grammar in a short time. Learning the rules from Wren and Martin will help you become a good English teacher but I guess that is not what you are aiming for. I hope with this post I would have been able to clarify any doubts and queries you have had with respect to books for CAT Exam Preparation. If you think you found this article helpful, please share it with your friends on Facebook. Study Plan for CAT Exam Preparation – What to do from Today? Which study material is best according to you for CAT 2017? Time/ IMS/ CL????? Hello Sir these are great recommendations by you. I just wanted to ask that as i have enrolled in your complete mba prep course, are the materials provided in it not enough for the preparation? These give you the required stuff for practice. I had a 3month coaching for CAT last year from Career Launcher n have the study material. But the material is module wise n I m being inconsistent with my practice. I was hoping to get a separate book for Quant. Is it necessary that I complete my modules first? You should definitely complete the modules first. CL has good material. You should move on to a book only after you are done with the modules. I am new to this stream (i know there are many ) Now I am studying for my B.Tech degree (1st year). My question is if I have to start preparing for CAT when is the best time to start it and how long will it take to have a very good preparation to crack it? just a suggestion is required Sir. Haa has!!! Really lol I study for cat from now.Dont study for this .stop.if u study.then you are wrong.please attention in your n.tech subject and cgpa this is more important for iim admission. And also 10th 12th percentage. i have already joined time coaching and instead of going through their material for quants, i have been following Arihant’s Sarvesh k verma , IS it fine? I’m going to start preparing for CAT from today as I’m very much confused b/w offline and online coaching class ? i am in class 12 ..when i have to start the preperation of cat exam pl guide me and mat exam also? if you are in class 12 , the best way to prepare for CAT is not to prepare for it at all now and focus on your 12th percentege.